More info coming soon to my new website! Liam Robinson is a composer and performer living in New York City. His compositions often deal with a relationship with text or other external stimuli, including theatrical, visual, and installation elements. He is constantly working with the delicate balance between an attraction to external association and a dedication to pure sound. 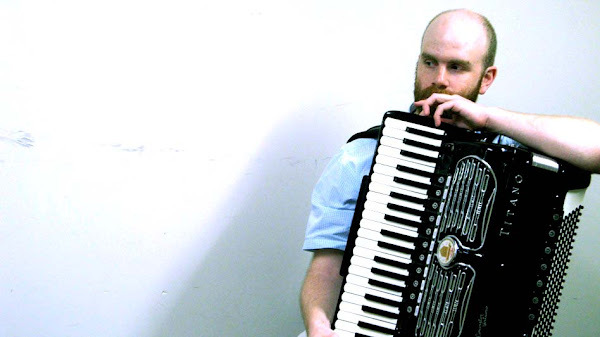 As a pianist, accordionist, vocalist, and actor, Liam performs regularly with Jean Rohe, the Becca Stevens Band, Ilusha Tsinadze, and as a solo performer. He can be heard on the acclaimed debut of the Becca Stevens Band, Tea Bye Sea and their 2011 release Weightless (Sunnyside) as well as on Jean Rohe’s worldly and literate Lead Me Home and Ilusha Tsinadze’s Mother Tongue, music from the Republic of Georgia. Liam is an avid folk musician and dance caller, and his folk music duo act with Jean Rohe can be heard on their self-released album Robinson & Rohe. He is currently playing the role of Songman in the Tony Award-winning Broadway production of War Horse at the Vivian Beaumont Theater at Lincoln Center. Liam is Artistic Co-Artistic Director of Red Light New Music, a 501(c)3 non-profit based in New York City. Red Light is an organization dedicated to presenting new and unheard composers to a wide audience. Each season the resident Red Light presents a series of diverse and provocative concerts with an emphasis on new commissions and reworked classics. In collaboration with colleague Vincent Raikhel, Liam recently co-edited the collection of writings, art, and music Original Tradition: The Influence of Nils Vigeland, Composer and Teacher. This book is dedicated to his former teacher at the Manhattan School of Music, where he received his BMA.